Why Does Scouting Make a Difference? It's no secret that America's youth are facing a crisis. With the rising number of troubled families which are often absent one or both parents, news stories are filled with increasing amounts of violence, drug abuse, and more. But this sort of thing has happened before: in England, in the early 1900s, where a movement began which would stem the tide of youth delinquency and open the path to a better way. When the founder of Boy Scouting, Robert Baden-Powell, returned home to England after serving in the Boer Wars in the early 1900s, he was troubled by what he saw. Many of the boys in his community were idle and wandering the streets, getting into mischief and causing problems with all kinds of riotous living. They lacked supervision and direction, as their fathers were away at war. Baden-Powell envisioned Scouting as not only an exciting organization that would keep these boys busy, but it would also be an engaging way to teach them morals and skills that would benefit their lives and their communities. We can see many similarities in our own society today. Gang violence runs rampant, everything from school shootings to graffiti, with many boys just plain getting in trouble. Our youth have too much time on their hands and too little direction in their lives. At this time in our history, boys need Scouting more than ever! As a nationwide and worldwide movement, Scouting is uniquely positioned to solve the crisis which America's youth are facing. The values of the Scout Oath and Law are virtues which people from all religions and backgrounds can agree upon—imagine what would happen if all the politicians, lawyers, and businessmen in the world did their best to always be Trustworthy, Loyal, Helpful, Friendly, Courteous, Kind, Obedient, Cheerful, Thrifty, Brave, Clean, and Reverent. The need is compelling, the structure of Scouting is there, and the Blue Grass Council is already serving over 6,800 youth in central and eastern Kentucky. With your help, the message and opportunity of Scouting can be shared with thousands more youth in this area. Scouting works! For over a hundred years, the Scouting program has made a positive difference in the lives of youth, providing them with the opportunity to try new things, provide service to others, build self-confidence, and reinforce ethical standards. These opportunities not only help them when they are young, but also carry forward into their adult lives, improving their relationships, their work lives, their family lives, and the values by which they live. A 2005 study by Harris Interactive supported these statistics, finding that 83% of men who were Scouts in their youth agree that the values they learned in Scouting continue to be very important to them today. 87% of men who remained in Scouting five or more years attribute some of their self-confidence in their work to their Scouting experience. Half of the group say Scouting had a positive effect on their career development and advancement, and 83% say there have been real-life situations where having been a Scout helped them be a better leader. Over 6,600 Scouts throughout 55 counties in central and eastern Kentucky are served by the dedicated volunteers and professionals of the Blue Grass Council. However, providing an outstanding Scouting program isn't free. 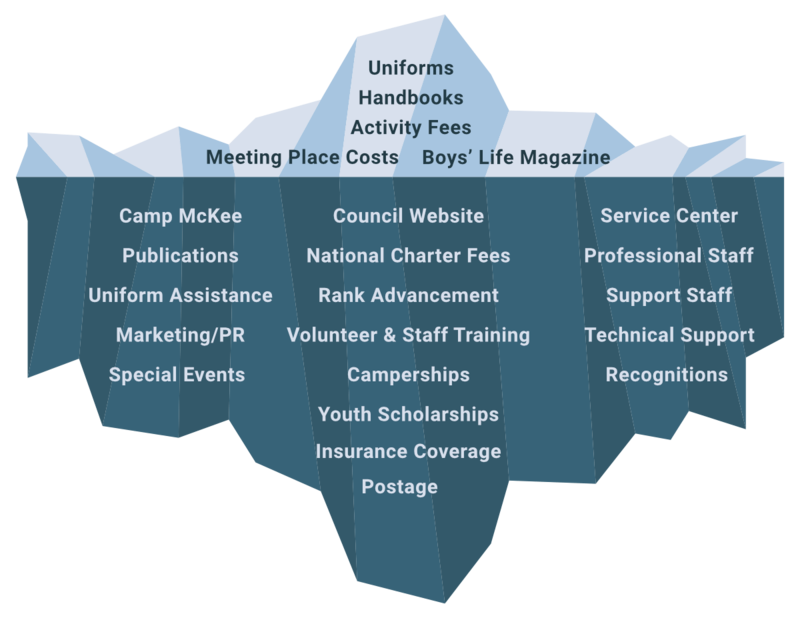 You can think of the “True Cost of Scouting” in terms of an iceberg. When you see an iceberg, only 20% is visible above the water. The rest of the iceberg is submerged, supporting the visible part. Like an iceberg, most Scouts and Scout families will only see 20% of the total operation of the Blue Grass Council or the Scouting program—they will not see the other 80% of the operation that makes the Scouting program come alive for their son or daughter. In order to continue providing the life-changing Scouting program to youth who need it, the Blue Grass Council must be able to pay these expenses. Want to be a part of helping America's youth, starting right here in Kentucky? Making a tax-deductible donation to the Blue Grass Council makes it possible for the council to continue paying the expenses that make Scouting possible. The graphic at right (or below, on mobile) shows how your Scouting dollars are spent. Over three-quarters of funds received go directly into providing a top-tier program for youth, covering expenses for program events, Camp McKee, and more. The remaining 21% is used to pay for the support services that are necessary for the Scouting program to function and grow, like the council service center, salaries for our dedicated professional staff, publications, this website, and more. The council treasurer, executive committee, and professional staff work very hard to maintain a balanced budget and put each and every dollar to use for Scouting. Will you help us? Scouting needs your help to continue changing the lives of thousands of youth! There are several ways to give: you can give through your unit's Family Friends of Scouting campaign, contact the council office to arrange for a donation, or simply click here and make a donation.